While it seems summer has flown by, I will fully admit that I am officially ready for fall (it all started with that first 60-degree morning a few weeks ago). Wreaths are one of the easiest ways to make your home welcoming. Instead of going for something overly holiday specific, select a base to keep it simple (and longer lasting). You also can add small touches (like small black bats for Halloween or an autumnal bow for Thanksgiving). Additionally, make sure to invest in a solid storage case for your purchase so you can enjoy them for years to come. Lanterns are among the most versatile pieces both inside and outside the house, and I love these large-scale lanterns that can be used year-round. Add a traditional or battery-operated candle in white or a seasonal color to keep things simple, or consider filling the lanterns with plastic eyeballs, faux leaves or pine cones (when winter comes). 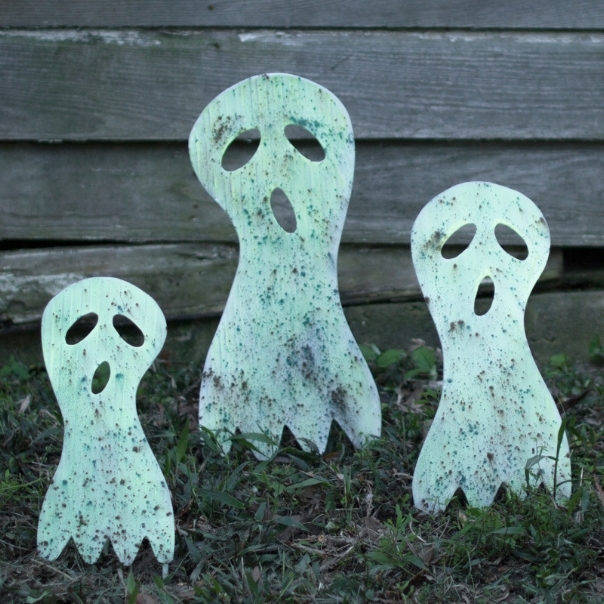 Moving ahead to Halloween, I haven't yet ordered these, but I am considering adding to this year's display. In addition to being creepy (but not too scary for younger kids), this trio of ghouls glows in the dark...and stores flat (for those of us with limited storage for seasonal items). Tombstones are standard exterior decor around October 31st, but these are unique in that you can customize the inscription and make it even more relevant to your family, your neighborhood or your city. I already own a few of these, and they add great dimension to any display and can be used in a myriad of ways (along the railings of a staircase, coming out of planters, etc.). Like the ghosts, they are creepy but playful enough for all ages. In addition to the stores highlighted through the picks above, definitely check out your local HomeGoods, Marshalls or other favorite discount store (their aisles are already filled with fall, Halloween and Thanksgiving options) for little touches to add to your ambiance!